"Delta Air" redirects here. For the defunct German airline, see DBA (airline). "Building a better airline, not just a bigger one"
Delta Air Lines, Inc. ("Delta"; NYSE: DAL) is a major American airline, with its headquarters and largest hub at Hartsfield–Jackson Atlanta International Airport in Atlanta, Georgia. The airline along with its subsidiaries and regional affiliates operate over 5,400 flights daily and serve an extensive domestic and international network that includes 319 destinations in 54 countries on six continents, as of October 2016. Delta is one of the four founding members of the SkyTeam airline alliance, and operates joint ventures with Air France-KLM, Alitalia, Virgin Atlantic, and Virgin Australia. Regional service is operated under the brand name Delta Connection. One of the five remaining legacy carriers, Delta is the sixth-oldest operating airline by foundation date, and the oldest airline still operating in the United States. The company's history can be traced back to Huff Daland Dusters, founded in 1924 in Macon, Georgia as a crop dusting operation. The company moved to Monroe, Louisiana, and was later renamed Delta Air Services, in reference to the nearby Mississippi Delta region, and commenced passenger services on June 17, 1929. Among predecessors of today's Delta Air Lines, Western Airlines and Northwest Airlines began flying passengers in 1926 and 1927, respectively. In 2013, Delta Air Lines was the world's largest airline in terms of scheduled passengers carried (120.6 million), and the second-largest in terms of both revenue passenger-kilometers flown (277.6 billion) and capacity (4.4 billion ASM/week; March 2013). Delta Air Lines began as a crop dusting operation called Huff Daland Dusters, Incorporated. The company was founded on May 30, 1924 in Macon, Georgia, and moved to Monroe, Louisiana, in 1925. They flew a Huff-Daland Duster, the first true crop duster, designed to combat the boll weevil infestation of cotton crops. Collett E. Woolman, one of the original directors, purchased the company on September 13, 1928, and renamed it Delta Air Service. Service began on June 17, 1929 with the inaugural flight between Dallas, Texas and Jackson, Mississippi. Delta moved its headquarters to its current location in Atlanta in 1941, and continued to grow through the addition of routes and the acquisition of other airlines. They replaced propeller planes with jets in the 1960s and entered international competition to Europe in the 1970s and across the Pacific in the 1980s. Delta's more recent history is marked by its emergence from bankruptcy on April 25, 2007, and the subsequent merger with Northwest Airlines. The merger was announced April 14, 2008, and was set to create the world's largest airline. After approval of the merger on October 29, 2008, Northwest continued to operate as a wholly owned subsidiary of Delta until December 31, 2009 when both carriers' operating certificates were merged (the Delta certificate was kept). Delta completed the integration with Northwest on January 31, 2010 when their reservation systems and websites were combined, and the Northwest Airlines name and brand were officially retired. Chicago and Southern Air Lines (formed in 1933, merged into Delta in 1953). Delta flew under the carrier name of Delta-C&S for the following two years. Comair began services in March 1977 and was headquartered at Cincinnati/Northern Kentucky International Airport. After successfully introducing 50-seat planes into the United States, it was acquired by Delta in October 1999. Comair became the main carrier of Delta Connection and operated over 400 daily flights from Cincinnati/Northern Kentucky International Airport throughout the U.S., Mexico, and Caribbean. Comair ceased operations on September 29, 2012, and was folded into Delta Connection operations. Delta Express began service in October 1996 in an attempt by Delta to compete with low cost airlines on leisure-oriented routes. Its main base of operations was Orlando International Airport and it used Boeing 737–200 aircraft. It ceased operations in November 2003 after Song was established. Song began service on April 15, 2003 as a single-class airline operated by Delta to compete directly with JetBlue Airways from both airlines' hub at New York–JFK. While the brand was considered a successful addition to the Northeast-to-Florida market, financially the airline suffered. On May 1, 2006, Song was folded into the Delta mainline brand. Song used Boeing 757 aircraft. Delta's corporate headquarters is located on a corporate campus on the northern boundary of Hartsfield-Jackson Atlanta International Airport, within the city limits of Atlanta. This location has served as Delta's headquarters since 1941, when the company relocated its corporate offices from Monroe, Louisiana, to Greater Atlanta. The crop dusting division of Delta remained headquartered in Monroe until Delta ceased crop dusting in 1966. Prior to 1981, the Delta corporate campus, an 80-acre (32 ha) plot of land in proximity to the old Hartsfield Airport terminal, was outside the City of Atlanta limits in unincorporated Fulton County. On August 3, 1981 the Atlanta City Council approved the annexation of 141 acres (57 ha) of land, an area containing the Delta headquarters. As of 1981 Delta would have had to begin paying $200,000 annually to the City of Atlanta in taxes. In September 1981 the airline sued the city, challenging the annexation on the basis of the constitutionality of the 1960 City of Atlanta annexation of the Hartsfield old terminal. The City of Atlanta was only permitted to annex areas that are adjacent to areas already in the Atlanta city limits. In addition to hosting Delta's corporate headquarters, Hartsfield-Jackson is also the home of Delta TechOps, the airline's primary maintenance, repair and overhaul arm and the largest full-service airline MRO in North America, specializing in engines, components, airframe and line maintenance. Delta maintains a large presence in the Twin Cities, with over 12,000 employees in the region as well as significant corporate support functions housed in the Minneapolis area, including the company's information technology divisional offices. Delta's logo, often called the "widget", was originally unveiled in 1959. Its triangle shape is taken from the Greek letter delta, and recalls the airline's origins in the Mississippi Delta. It is also said to be reminiscent of the swept-wing design of the DC-8, Delta's first jet aircraft. Delta's current livery is called "Upward & Onward". It features a white fuselage with the company's name in blue lettering, and a widget on the vertical stabilizer. Delta introduced its current livery in 2007 as part of a re-branding after it emerged from bankruptcy. The new livery consists of four colors, while the old one (called "colors in motion") used eight. This meant the switch saved the airline money by removing one day from each aircraft's painting cycle. The airline took four years to repaint all of its aircraft into the current scheme, including aircraft inherited from Northwest Airlines. Delta has ten domestic hubs and three international hubs. Delta carries more passengers than any other airline at Hartsfield–Jackson Atlanta International Airport, Cincinnati/Northern Kentucky International Airport, Detroit Metropolitan Wayne County Airport, Los Angeles International Airport, Minneapolis–St. Paul International Airport, John F. Kennedy International Airport, LaGuardia Airport, and Salt Lake City International Airport. Amsterdam Airport Schiphol – One of the two European hubs for Delta, in conjunction with SkyTeam partner KLM. Its presence is due mostly to Northwest Airlines' alliance with KLM prior to the merger. Charles de Gaulle Airport, Paris – Delta's other European hub. Operated in conjunction with SkyTeam partner Air France. Cincinnati/Northern Kentucky International Airport – Prior to the merger with Northwest Airlines, Cincinnati was the second largest hub for Delta with 670 daily departures. Since the merger, service has been drastically cut, mainly due to its proximity to the Detroit hub, as well as the shutdown of Comair. Detroit Metropolitan Wayne County Airport – Acquired through the merger with Northwest Airlines, Detroit is Delta's second-largest hub by number of daily flights and third largest by seats available. It also serves as the airline's primary Asian gateway for the northeastern United States. Hartsfield–Jackson Atlanta International Airport – The largest hub for Delta Air Lines, as well as its headquarters site and maintenance base. John F. Kennedy International Airport, New York City – A major international gateway hub for Delta, primary European gateway to the United States. LaGuardia Airport, New York City – Created as a result of a slot swap with US Airways and handles mostly domestic and North American traffic. Logan International Airport, Boston – A hub for Delta in the second half of the 20th century and remained one until the early 2000s. In 2005, a new terminal, Terminal A, was built at Logan for Delta's sole use. However, when Delta went bankrupt, they leased 11 of the 22 gates in the terminal. Today, Delta still has a large share in the Boston market, with daily international flights to various cities in Central America, Canada, and major European cities, including Amsterdam, London, and Paris. They now occupy 17 of the 22 gates and have recently opened a second Sky Club location. Los Angeles International Airport – Delta dismantled its Western Airlines-inherited LAX hub in the mid-1990s when it decided to relocate most of those aircraft to the U.S. East Coast. Since that point, however, it has re-opened its hub there, mostly flying to Mexico, Florida, and Hawaii. As of May 2015, Delta captured a 17.22% passenger market share with 139 daily departures to Hawaii, Mexico, Japan, Guatemala, and some of Delta's large domestic bases throughout the United States, as well as regional service to the West Coast. Minneapolis-Saint Paul International Airport – Delta's third-largest hub by number of daily flights and second largest by number of seats available. Delta served 25,844,791 passengers at MSP in 2015 and accounts for more than 80% of the airport's traffic. Delta serves mostly regional airports from MSP and serves most Canadian and American metropolitan areas. Delta also serves the Caribbean, Central America, Hawaii (seasonally), Mexico, 3 year-round and 2 seasonal destinations in Europe, and Tokyo, Japan. It is also the former headquarters for Northwest Airlines. Narita International Airport, Tokyo – Delta's Asian hub, acquired through the merger with Northwest Airlines. Salt Lake City International Airport – Western Airlines' Salt Lake City hub operations were continued after Delta purchased Western Airlines in 1987. Salt Lake City International Airport is Delta's fifth-largest hub. Seattle-Tacoma International Airport – Delta announced its eighth U.S. hub on June 17, 2014 in conjunction with the launch of its new Seattle-Hong Kong service. The hub serves as Delta's main international gateway to Asia. Delta started building its international gateway in Seattle in 2011, and in 2013 began to add major domestic feeder service as well. However, the rapid expansion resulted in a turf war between Delta and hometown airline Alaska Airlines. These statistics about Delta's hubs are current as of June 2016. (Ranked by daily departures). O'Hare International Airport – Delta operated a small hub at Chicago until the early 1990s. Dallas/Fort Worth International Airport – Delta at one time operated over 200 flights per day from DFW. At times, it was Delta's third-largest hub behind Atlanta and Cincinnati, respectively. Delta closed the hub in February 2005 due to competition with American Airlines, which had their largest hub at DFW. Frankfurt Airport – Upon Pan American World Airways' bankruptcy, Delta acquired its Frankfurt hub and the remainder of its Atlantic Division (including the JFK Worldport). Delta closed the hub in 1997. Memphis International Airport – A Delta hub that was originally dismantled but regained hub status through the merger with Northwest. On September 3, 2013, Delta reduced its flights from Memphis to approximately 60 flights per day to remove it as a hub. In December 2014, flights were cut down to 25 daily flights to 10 destinations, fully removing the airport's hub status. Orlando International Airport – Delta built up its Orlando hub with the conjunction of Comair in the mid-1980s, and subsequently became the "Official Airline of Walt Disney World". The airport then became the hub for Delta Express and Song, before Delta pulled back mainline presence in the mid 2000s. Portland International Airport – Delta built up its Portland hub in the late 1980s to gain a presence in the U.S. to Asia market. The hub operated most of Delta's flights to Asia, but was slowly reduced due to the Japanese and Korean economic recession, and closed in 2001. Between its mainline operation and subsidiaries, and as of March 2015, Delta employs nearly 80,000 people. Joanne Smith is Executive Vice President and Chief Human Resources Officer responsible for the oversight and support of personnel needs at Delta. She was appointed on October 1, 2014 replacing Mike Campbell. Delta's 12,000 mainline pilots are represented by the Air Line Pilots Association, International and are the union's largest pilot group. The company's approximately 180 flight dispatchers are represented by the Professional Airline Flight Control Association (PAFCA). Not counting the pilots and flight dispatchers, Delta is the only one of the five largest airlines in the United States, and one of only two in the top 9 (the other being JetBlue), whose non-pilot USA domestic staff is entirely non-union. This caused issues during and after the merger with Northwest, whose employees had a much higher rate of unionization. Pilots at both airlines were unionized. Northwest Airlines flight attendants were formerly represented by the Association of Flight Attendants (AFA). A vote on unionization with the AFA at the post-merger Delta was held on 3 November 2010, unionization was narrowly rejected by flight attendants, with 9,544 votes against unionization and 9,216 in favor. The AFA accused Delta of interference in the vote and requested the National Mediation Board (NMB) investigate and order a second vote. The NMB investigation found that the election was not compromised and dismissed the claim. Currently both the International Association of Machinists and Aerospace Workers and a coalition of the AFA and the Transport Workers Union of America are seeking to hold unionization votes for Delta flight attendants. Delta Air Lines destinations as of November 2014. Year-round destinations are red, seasonal destinations are pink, and former destinations are dark grey. As of October 2016, flights to Bangkok ended. As of March 2015, Delta operates more than 5,400 flights per day. Delta Connection operates 2,533 daily flights. It is one of the few airlines to fly to all six inhabited continents, along with Air Canada, Air China, Air France, British Airways, Emirates, Etihad Airways, Korean Air, Qantas, Qatar Airways, Singapore Airlines, and South African Airways. Delta is the only U.S. carrier that is flying to Accra, Copenhagen, Dakar, Johannesburg, Moscow, Prague, Reykjavik, and Stuttgart. Inherited from the Northwest-KLM relationship (which is older than any of the three major airline alliances including SkyTeam itself), Delta has a transatlantic joint venture with Air France-KLM and Alitalia. The program coordinates transatlantic operations, including ticket pricing, schedules, capacity, and revenue. On January 27, 2012, the European Commission launched an investigation into the impact of the joint venture on competition on the routes that it covers. As of January 2013, Delta operates a fleet of more than 800 aircraft manufactured by Airbus, Boeing, and McDonnell Douglas. Delta operates the largest fleets of Boeing 717, Boeing 757, Boeing 767, McDonnell Douglas MD-88, and McDonnell Douglas MD-90 aircraft in the world, and the largest fleet of Airbus A330 aircraft of any US airline. Prior to its 2008 merger with Northwest Airlines, Delta's fleet was made up of solely Boeing and McDonnell Douglas aircraft; Airbus aircraft from Northwest joined the fleet after the merger. Unlike other mainline U.S. legacy carriers, Delta often seeks to acquire and utilize older aircraft, especially narrow-bodies, and the airline has created a very extensive MRO (maintenance, repair and overhaul) organization, called TechOps, to support them. The oldest aircraft in the fleet are the McDonnell Douglas MD-88s, with an average age of over 25 years. Delta buys older airplanes as sources for spare parts. However, Delta is replacing some of the oldest airplanes in its fleet. To replace the McDonnell Douglas DC-9s, MD-88s, and older A320 and 757-200 aircraft in their fleet, Delta began discussing narrowbody replacement plans with manufacturers such as Airbus, Boeing and Bombardier in early 2011. On August 22, 2011, Delta placed an order for 100 Boeing 737-900ER aircraft and deferred an order of 100 small narrow-body jets until 2012. Delta officially retired the DC-9 from its fleet on January 6, 2014; however, the DC-9 was used on an as-needed basis until January 22, 2014 when the last DC-9 was removed from service. Delta was the final US carrier operating the DC-9. On August 1, 2014, Delta announced that 4 Boeing 747-400s would be retired before the end of 2014. As of November 2014, 3 of them have been retired. On October 16, 2014, during the carrier's third-quarter earnings call, CEO Richard Anderson announced that the rest of the fleet would be retired by the end of 2017. Delta announced on November 20, 2014, that it had ordered 25 Airbus A350-900s and 25 Airbus A330-900neos to replace the aging Boeing 747 and Boeing 767 fleets. Delta will take delivery of the A350s beginning in the second quarter of 2017 and the A330-900neo in 2019. On April 28, 2016, Delta Air Lines secured a firm order for 75 Bombardier CS100 aircraft with 50 options, totalling up to 125 aircraft. Delta One is the airline's long-haul international business class. The class was known as "BusinessElite" until March 1, 2015. Passengers in the Delta One cabin receive complimentary meals, refreshments, alcoholic beverages, and an amenity kit. Delta One is also available on domestic transcontinental service from New York-JFK to Los Angeles and San Francisco. The flat-bed Delta One seats on Boeing 767-300ER and Boeing 767-400ER aircraft (made by Contour Aerospace and designed by James Thompson) feature a space-saving design, with the bottom ends of the seats extending under the armrests of the suites in front when in the horizontal position. The flat-bed Delta One seats on the Boeing 777-200ER/LRs feature sleeper suites made by Contour Aerospace and configured in a herringbone pattern with seats angled towards the aisle. The flat-bed seats on all Boeing 747-400 and Airbus A330s (as of October 2012) feature the Cirrus flat-bed sleeper suite made by Zodiac Seats U.S. (formerly Weber Aircraft LLC), designed by JPA Design Consultants, and configured in a reverse herringbone patterns with seats angled away from the aisles. Boeing 757-200 and aircraft configured with the Delta One cabin feature older recliner-style seating made by Recaro. Delta One seats on 767-300ERs have 60 inches (1,500 mm) of pitch and 18.5 inches (470 mm) of width, while seats on Boeing 757-200s have 55 inches (1,400 mm) of pitch and 20 inches (510 mm) of width. All seats are equipped with a personal, on demand In-Flight-Entertainment (IFE) system, universal power-ports, a movable reading light, and a folding work table. The Delta One seats ex-American Airlines/TWA 757-200s have electric recline, while those on ex-Northwest Airlines aircraft have mechanical recline. The ex-Northwest aircraft are planned to be converted back to a domestic configuration. On November 5, 2012, Delta announced it would introduce a flat-bed Delta One product on its ex-American Airlines/TWA 757-200s. The seats will be a modified version of the Diamond flat-bed seat by BE Aerospace designed exclusively for Delta. In April 2016, CEO Ed Bastian announced that a new Premium Economy cabin will be added. This new Premium Economy would feature extra legroom, leg rests, extra recline, extra width and a new premium service. Delta will introduce it on the Airbus A350, and then 777, A330 and 767-400. First Class is offered on all domestic aircraft, as well as Delta Connection aircraft with more than 50 seats. Seats range from 18.5 to 20.75 inches (47.0 to 52.7 cm) wide and have between 37 and 40 inches (94 and 102 cm) of pitch. Passengers aboard this class receive free snacks, drinks, and alcohol, with full meal service on flights 900 miles and longer. Certain aircraft also feature power-ports at each seat. Delta Comfort+ on a 757-200. Delta Comfort+ seats are installed on all Delta aircraft, as well as all two-cabin Delta Connection aircraft and feature 34–36 inches (860–910 mm) of pitch; on all Delta One configured aircraft, 35–36 inches (890–910 mm) of pitch and 50 percent more recline over standard Main Cabin seats. The seats were known as "Economy Comfort" until March 1, 2015. Additional amenities include: Sky Priority Boarding, dedicated overhead space, complimentary beer, wine, and spirits on flight 250 miles or more and on flights 900 miles or more, complimentary premium snacks are served. Complimentary premium entertainment is available via the Delta Studio, with free headsets available on most flights. On transcontinental flights between JFK-LAX/SFO, Delta Comfort+ passengers also get Luvo snack wraps. Customers can upgrade from standard Main Cabin seats to Delta Comfort+ seats either for a fee or using either SkyMiles or for free if a medallion member. For domestic flights and flights between the U.S. and Canada, Delta Comfort+ is available as a fare option. Delta Comfort+ more closely aligns Delta's offerings with its Transatlantic joint venture partners as KLM also offers a Comfort+ section of its Main Cabin that features similar seat pitch and recline. Main Cabin (also known as "Economy Class") is available on all aircraft with seats ranging from 17 to 18 inches (43 to 46 cm) wide and 30 to 33 inches (76 to 84 cm) of pitch. The main cabin on Boeing 737, 747-400, 777, and selected Boeing 757-200, 767-300, and McDonnell Douglas MD-90 aircraft have an articulating seat bottom where the seat bottom moves forward in addition to the seat back tilting backwards when reclining. Main Cabin passengers receive complimentary snacks and non-alcoholic drinks domestically. Alcoholic beverages are also available for purchase. Complimentary meals and alcoholic drinks are provided on long-haul international flights. As part of Delta's EATS buy on board program, food is available for purchase on all domestic flights 1,500 miles (2,400 km) or more (including Hawaii and Alaska flights, which no longer offer complimentary meal service). 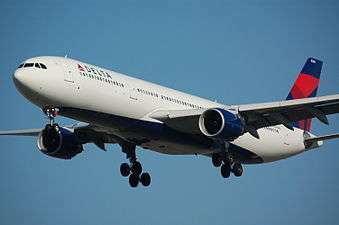 Delta operated a different buy on board program between 2003 and 2005. The previous program had items from differing providers, depending on the origin and destination of the flight. Prices ranged up to $10 ($12.55 when adjusted for inflation). The airline started the service on a few selected flights in July 2003, and the meal service was initially offered on 400 flights. Delta ended this buy on board program in 2005; instead, Delta began offering snacks at no extra charge on flights over 90 minutes to most U.S. domestic flights and some flights to the Caribbean and Latin America. Beginning in mid-March 2005 the airline planned to stop providing pillows on flights within the 49 contiguous U.S. states, Bermuda, Canada, the Caribbean, and Central America. In addition, the airline increased the price of alcoholic beverages on Delta mainline flights from $4 ($4.85 when adjusted for inflation) to $5 ($6.07 when adjusted for inflation); the increase in alcohol prices did not occur on Song flights. Basic Economy is a basic version of Main Cabin, offering the same services with fewer flexibility options for a lower price. Examples of fewer flexibility options include no ticket changes and only having a seat assigned at check-in. On August 5, 2008, Delta announced it would be installing the Aircell mobile broadband network, Gogo, which enables customers traveling with Wi-Fi enabled devices, such as laptops, smartphones, and tablets, to access the Internet for a fee. Gogo was initially offered on Delta's fleet of McDonnell Douglas MD-88 and MD-90 aircraft but has expanded to the remaining domestic fleet, as well as Delta Connection aircraft with a first class cabin. Delta has the largest fleet of Wi-Fi-equipped aircraft in the world. The airline introduced its first in-flight Wi-Fi on international routes to Tokyo from Los Angeles and Atlanta in March 2014, and stated its intent to offer the service on all transoceanic flight routes by the end of 2015. Even though Delta has announced the retirement of its 747 fleet, all Delta 747s are wifi-equipped and Delta is currently installing wifi on the 777 fleet. Moving Map on a 757-200. In the 1960s audio programming was introduced where passengers wore headphones consisting of hollow tubes piping in music. These were installed in some Delta aircraft. Some early wide-bodied aircraft, including the Lockheed L-1011, Boeing 767-200, and 767-300 fleet, had movies projected on to the cabin bulkhead. Also during the late 1980s and early 1990s, CRT monitors over the aisles were added to the 757 fleet, making them the first narrowbody aircraft to feature video entertainment. The MD-90 introduced Delta's first IFE system with LCD monitors in 1995, and the 777 introduced Delta's first in-seat video system in 1999, initially using the Rockwell Collins Total Entertainment System. Delta's first all-digital IFE system with AVOD (Panasonic eFX) was first introduced in 2003 on Delta's former low-cost subsidiary, Song. The Rockwell Collins IFE system on the 777s was replaced by the Panasonic eFX system in 2007, followed by the Panasonic eX2 in 2011. The Panasonic eFX and eX2 systems are trademarked by Delta as Delta on Demand. In the spring of 2010, Delta installed the Panasonic eFX AVOD system in Economy on six 767-300ERs that are used on routes that are 12 hours or longer. Delta also announced it would be installing AVOD in Economy class on all Boeing 767-300ER and 747 aircraft over the next 3 years. On July 27, 2010, Delta announced that it would be the launch customer of the new eX2 AVOD system with the Eco 9i Integrated Smart Monitor, a new ultra-lightweight IFE system by Panasonic Avionics Corporation and Zodiac Seats U.S.. The systems have been installed on the entire 747-400 fleet as of October 2012, and are currently being installed on the 767-300ER fleet (except for the six aircraft previously retrofitted with the eFX system in 2010). A different version of the Integrated Smart Monitor developed by Panasonic Avionics Corporation and BE Aerospace is currently being installed on the Airbus A330 fleet. These seats will also be installed on the Boeing 757-300 and new Boeing 737-900ER fleet, and will replace the existing seats and monitors on the international Boeing 757-200 fleet. In 2012, Delta began replacing the overhead CRT monitors on the pre-merger Delta 757-200 fleet with new LCD monitors. This was completed in late 2012. The 767-400ER fleet initially featured LCDs over the aisles, but were replaced in 2009 by the Panasonic eFX AVOD system when the last of the 767-400ERs were converted from domestic to international use. CRT projectors were originally featured in economy class on Boeing 767–300s, with the international 767-300ERs also featuring ceiling-mounted CRT displays over the aisles, which have since replaced by LCD monitors, and are now in the process of being converted to the eFX2 AVOD system. When Delta's ex-TWA ETOPS 757s were first delivered, they featured a system made by Sony Transcom (a former subsidiary of Sony now sold to Rockwell Collins) system that was factory installed for TWA. The system featured overhead drop-down LCD monitors similar to Delta's non-Transcon 737-800s and 757-300s. Delta replaced the Sony Transcom system with the Panasonic eFX system featuring in-seat video and AVOD at the same time as the new BusinessElite seats and slimline economy class seats were installed. Audio and video are available on all aircraft except for the Airbus A320, McDonnell Douglas MD-80 and MD-90, selected Boeing 757, and Delta Connection aircraft. Boeing 777-200ER, 777-200LR, and 747 aircraft, along with those 767-300 and A330 aircraft that have completed cabin modifications, feature the Panasonic eX2 system. Compared to the older eFX system, this offers greater storage capacity, as well as larger personal video screens. Boeing 767-400ER aircraft, selected 757-200 aircraft, as well as the remaining internationally configured Boeing 767-300ER aircraft that have not completed cabin modifications, use the Panasonic eFX AVOD system. On these 767-300 aircraft, AVOD is available only in the Delta One class, while the system includes overhead LCD monitors and audio programming for passengers seated in the Economy cabin. The unmodified Airbus A330 aircraft feature the Panasonic 3000i AVOD system in all cabins. This system includes supplemental LCD monitors over the aisles for displaying the safety video and moving map. Domestic Boeing 767–300s, Boeing 737–700s, as well as selected transcontinental Boeing 757–200s and selected Boeing 737–800s using the Panasonic eFX system, also feature live television via Dish Network in both first class and economy. Some Boeing 737-800s, as well as all Boeing 757–300s feature systems with drop-down LCD displays below the overhead bins. All aircraft with AVOD feature Panasonic's iXplor moving map program. 737-800s with overhead video and the coach sections of 767-300ER aircraft with overhead video feature the Rockwell Collins Airshow moving map, which is often shown during takeoff and landing. Other aircraft formerly equipped with the Rockwell Collins Airshow moving map included the Lockheed L-1011-250 and -500, McDonnell Douglas MD-11, and Boeing 767-400ER and 777-200ER. The L-1011 and MD-11 fleet have since been retired, while the 767-400ER and 777-200ER have since had their Airshow systems replaced by the Panasonic iXplor system built into the eFX and eX2 AVOD systems. Delta Sky Magazine, and its online edition at www.deltaskymag.com, are published by MSP Communications in Minneapolis, Minnesota. SkyMiles is the frequent flyer program for Delta Air Lines. Delta Air Lines' airport lounges are called Sky Clubs. Membership options include single visit passes and annual memberships that can be purchased with either money or miles. International business class passengers get free access. Membership can also be granted through top level Delta status or with the purchase of some American Express credit cards. Features vary by location, but generally include free drinks (including alcoholic beverages), snacks and reading material. Wi-Fi is free for members and guests and is mostly provided in the USA by AT&T. Other benefits for Sky Club members include reciprocal lounge access with other SkyTeam members and Delta's other partners. Originally, Delta's membership-based airport clubs were called Crown Room lounges, with Northwest's called WorldClubs. On November 27, 2001, Delta Air Lines launched SkyBonus, a program aimed toward small-to-medium businesses spending between $5,000 and $500,000 annually on air travel. Businesses can earn points toward free travel and upgrades, as well as Sky Club memberships and SkyMiles Silver Medallion status. Points are earned on paid travel based on a variety of fare amount paid, booking code, and place origin or destination. While enrolled businesses are able to earn points toward free travel, the travelling passenger is still eligible to earn SkyMiles during his or her travel. In early 2010, Delta Air Lines merged its SkyBonus program with Northwest's similar Biz Perks program. In 2008, Delta Air Lines was given an award from the United States Environmental Protection Agency's Design for the Environment (DfE) program for their use of PreKote, a more environmentally friendly, non-hexavalent chromium surface pretreatment on its aircraft, replacing hazardous chemicals formerly used to improve paint adhesion and prevent corrosion. In addition, PreKote reduces water usage by two-thirds and reduces wastewater treatment. PreKote is also saving money by reducing the time needed to paint each airplane. With time savings of eight to ten percent, it will save an estimated more than $1 million annually. 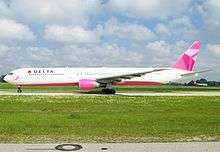 Boeing 767-400ER painted in pink livery for Breast Cancer Research Foundation (BCRF), at Munich Airport in 2010. The same plane as above, re-christened in the memory of BCRF founder Evelyn Lauder, at JFK Airport in early 2015, with the pink ribbons on the engine nacelles. In September 2015, the same aircraft was repainted again in a hybrid livery, carrying BCRF titles on the nose with a pink ribbon across the fuselage, approaching the same airfield as the above picture. Delta served as the official airline of the 1996 Summer Olympics in Atlanta, the 2002 Winter Olympics held in Salt Lake City, and is also the official airline for Major League Baseball teams such as the Atlanta Braves, Cincinnati Reds, Detroit Tigers, Minnesota Twins, New York Mets, New York Yankees, Pittsburgh Pirates, San Diego Padres, St. Louis Cardinals, Washington Nationals, National Hockey League teams Buffalo Sabres, Los Angeles Kings, Los Angeles Lakers, Los Angeles Sparks, Chelsea F.C., Madison Square Garden, Seattle Seahawks, Seattle Sounders FC, Copa América Centenario and the Atlanta Dream. Vivint Smart Home Arena in Salt Lake City, home of the NBA's Utah Jazz, was originally known as the Delta Center. Delta held the naming rights to the arena from 1991 to 2006 and continues to be an official sponsor of the team. Delta was a sponsor of the 2009 North American International Auto Show in Detroit. Delta is the official airline for the Grammy Awards. Also in 2011, Delta is the official airline for the Durham Bulls minor league baseball team. In August 2011, Delta continued its push into New York City by securing its first arts sponsorship. The deal, with the Whitney Museum, makes Delta the official and exclusive airline of the museum. Delta has sponsored various LGBT Pride events in Atlanta, New York City, Salt Lake City and Detroit. Delta also sponsors the University of Georgia and Georgia Tech athletics and provides transportation for away games. Delta Air Lines is the official airline of Syracuse University Athletics and has marketing relationships with eight additional NCAA athletic programs—Boston College, Brigham Young, Duke, Georgia Tech, University of Georgia, University of Michigan, University of Minnesota and University of North Carolina. Delta serves as the charter carrier for 41 NCAA football programs. In 2014, Delta sponsored Yomiuri Giants, a Nippon Professional Baseball team. This is the first time that Delta sponsored a foreign sports team. As part of the rebranding project, a safety video featuring a flight attendant showed up on YouTube in early 2008, getting over 1 million views and the attention of news outlets, specifically for the video's tone mixed with the serious safety message. The flight attendant, Katherine Lee, was dubbed "Deltalina" by a member of FlyerTalk for her resemblance to Angelina Jolie. Delta had considered several styles for its current safety video, including animation, before opting for a video presenting a flight attendant speaking to the audience. The video was filmed on a Boeing 757. The following are major accidents and incidents that occurred on Delta mainline aircraft. For Northwest Airlines incidents, see Northwest Airlines accidents and incidents. For Delta Connection incidents, see Delta Connection incidents and accidents. The attempted bombing of Northwest Airlines Flight 253 on December 25, 2009 occurred four days before the operating certificates of Northwest and Delta were combined (December 31, 2009). The aircraft involved in the incident was in Delta livery and reported in some early news reports as "Delta Flight 253." 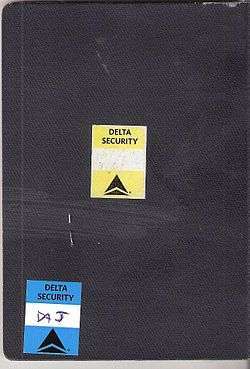 Delta Security stickers on the back of a passport. July 31, 1972, a Delta Flight 841, a Detroit to Miami DC-8 flight, was hijacked to Algiers, Algeria by 8 hijackers. The aircraft stopped in Boston to pick up an international navigator. The flight was allowed to return with passengers to the U.S., stopping in Barcelona for refueling. On February 22, 1974, Samuel Byck, an unemployed tire salesman from Pennsylvania, stormed aboard Delta Air Lines Flight 523, DC-9 flight at Baltimore Friendship Airport (now Baltimore/Washington International Thurgood Marshall Airport) scheduled to fly to Atlanta and shot both pilots, killing the First Officer, Fred Jones. He intended to crash the plane into the White House. After shooting the pilots, the hijacker grabbed a passenger and demanded that she fly the aircraft. The hijacking attempt ended when, after a standoff with police, Byck was shot twice through an aircraft porthole by a Md. policeman, severely wounding him. Before police stormed the plane, Byck killed himself. The plane never left the gate during this incident. On August 23, 1980, a Delta Air Lines L-1011 on a San Juan to Los Angeles flight was hijacked and flown to Cuba. The hijacker was jailed by Cuban authorities, and all passengers were released unharmed. On September 13, 1980, a Delta Air Lines New Orleans to Atlanta flight was taken over by two hijackers and forced to fly to Cuba. The flight continued to Atlanta after stopping in Havana. The hijackers were imprisoned by Cuban authorities. One hijacker was released and later sought US residency. The suspect was later arrested by US authorities in 2002 and sentenced to life in prison the following year without parole. ↑ "History". news.delta.com. Delta Air Lines Inc. October 2010. Retrieved January 11, 2011. 1924 The Huff Daland Dusters crop-dusting operation, which formed the roots for Delta, founded in Macon, Ga. Passenger Airline founded 1929, Monroe, La. ↑ Norwood, Tom; Wegg, John (2002). North American Airlines Handbook (3rd ed.). Sandpoint, Idaho: Airways International. p. 40. ISBN 0-9653993-8-9. 1 2 "Delta Air Lines Hub Station Amsterdam". delta.com. March 4, 2016. Retrieved April 13, 2016. 1 2 "Delta Air Lines Hub Station Paris". delta.com. March 4, 2016. Retrieved April 13, 2016. 1 2 "Delta Air Lines Hub Station Cincinnati". delta.com. March 4, 2016. Retrieved April 13, 2016. 1 2 "Delta Air Lines Hub Station Detroit". delta.com. March 4, 2016. Retrieved April 13, 2016. 1 2 "Delta Air Lines Hub Station Atlanta". delta.com. March 4, 2016. Retrieved April 13, 2016. 1 2 3 4 "Delta Air Lines Hub Station New York City". delta.com. March 4, 2016. Retrieved April 13, 2016. 1 2 "Delta Air Lines Hub Station Boston". delta.com. March 4, 2016. Retrieved April 13, 2016. 1 2 "Delta Air Lines Hub Station Los Angeles". delta.com. March 4, 2016. Retrieved April 13, 2016. 1 2 "Delta Air Lines Hub Station Minneapolis". delta.com. March 4, 2016. Retrieved April 13, 2016. 1 2 "Delta Air Lines Hub Station Tokyo". delta.com. March 4, 2016. Retrieved April 13, 2016. 1 2 "Delta Air Lines Hub Station Salt Lake City". delta.com. March 4, 2016. Retrieved April 13, 2016. 1 2 "Delta Air Lines Hub Station Seattle". delta.com. March 4, 2016. Retrieved April 13, 2016. ↑ "Delta to renovate RDU Sky Club, add premium bar". March 2, 2016. Retrieved March 31, 2016. 1 2 3 4 5 6 7 8 "Corporate Stats and Facts". News Hub. Delta. September 30, 2016. Retrieved October 2, 2016. ↑ "2010 Form 10-K, Delta Air Lines, Inc.". United States Securities and Exchange Commission. Retrieved July 1, 2011. 1 2 "Aircraft Fleet". delta.com. Delta Air Lines, Inc. 27 February 2016. ↑ "Corporate Stats and Facts Delta Hub News". Retrieved 2 October 2016. 1 2 "Delta announces executive succession". ↑ "Delta Air Lines, Inc. - Financial Information - Earnings Releases". ↑ "Federal Aviation Administration – Airline Certificate Information – Detail View". FAA.gov. Retrieved 2012-05-01. ↑ "Scheduled Passengers Carried". IATA World Air Transport Statistics (WATS), 58th edition. Retrieved 29 July 2014. ↑ "Scheduled Passenger - Kilometres Flown". IATA World Air Transport Statistics (WATS), 58th edition. Archived from the original on December 16, 2012. Retrieved 29 July 2014. ↑ "REVEALED:The World's 50 biggest airlines by capacity". The Aviation Writer. Retrieved 29 July 2014. 1 2 3 Jamil S. Zainaldin of the Georgia Humanities Council, "Delta Air Lines", The New Georgia Encyclopedia (updated May 31, 2007). ↑ Rebecca Heslin (31 December 2009). "Delta, Northwest approved to fly under single operating certificate". USA Today. usatoday.com. Retrieved 2013-01-31. ↑ Jad Mouawad (18 May 2011). "Delta-Northwest Merger's Long and Complex Path". The New York Times. NYTimes.com. Retrieved 2013-01-31. ↑ "Delta Through the Decades". Delta.com. Retrieved 2012-04-05. ↑ "Delta's Dilemma – Knowledge@Emory". Knowledge.emory.edu. March 10, 2004. Archived from the original on July 18, 2011. Retrieved May 4, 2010. ↑ William E. Schmidt (16 July 1987). "Delta Loyalists Alarmed And Bruised by Mishaps". The New York Times. NYTimes.com. p. A16. Retrieved 2009-12-27. ↑ "Contact Corporate." Delta Air Lines. Retrieved October 17, 2008. ↑ "Zoning Ordinance of Atlanta, Georgia Sheet No. 14-128." () City of Atlanta. Retrieved October 17, 2008. ↑ Markiewicz, David. "Issues change, but Chamber rolls on 150 years later." Atlanta Journal Constitution. Wednesday December 2, 2009. Retrieved on December 27, 2009. ↑ "DELTA AIR LINES STARTED AS CROP-DUSTING SERVICE." Associated Press at St. Louis Post-Dispatch. September 1, 1988. 11A. Retrieved on December 27, 2009. 1 2 "Delta suing City of Atlanta." Associated Press at Rome News-Tribune. Wednesday September 2, 1981. p. 10A. Retrieved from Google News (6 of 29) on December 19, 2013. ↑ "Capa Centre For Aviation". Archived from the original on 2013-12-20. Retrieved 2013-05-22. ↑ "Delta Air Lines officially opens Minnesota headquarters". Minnesota Public Radio News. Minnesota.publicradio.org. January 29, 2010. Retrieved July 7, 2011. ↑ "MAC Approves Agreement with Delta for 10,000 Minnesota Jobs and 400 Daily Departures from Minneapolis–St. Paul Hub". News.delta.com. January 26, 2009. Retrieved July 7, 2011. 1 2 Jad Mouawad (23 December 2011). "On Jet Exteriors, a Parade of Vanilla". The New York Times. NYTimes.com. Retrieved 2013-01-31. ↑ "Delta Air Lines Logo". Retrieved July 15, 2016. 1 2 "Delta Air Lines Newsroom - Hubs". delta.com. March 4, 2016. Retrieved March 10, 2016. ↑ McCartney, Scott (22 May 2014). "The Most Expensive Airports to Fly To". Wall Street Journal. Retrieved 7 August 2014. Delta still carries 75% of all of Cincinnati's passengers, giving it strong pricing power, said Candace McGraw, chief executive officer at the airport. 1 2 "MAY 2014 TRAFFIC REPORT" (PDF). THE PORT AUTHORITY OF NY & NJ. 2014-07-16. Retrieved 7 August 2014. ↑ Yamanouchi, Kelly (30 November 2011). "Hub changes hit Cincinnati hard". The Atlanta Journal-Constitution. ajc.com. Retrieved 2012-04-05. ↑ "MetroAirport.com". MetroAirport.com. Retrieved May 4, 2010. 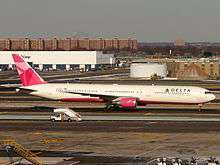 ↑ "Delta Unveils Schedule for New Domestic Hub at New York's LaGuardia Airport - Dec 16, 2011". News.delta.com. Retrieved 2012-04-05. ↑ "Los Angeles International Airport Top 10 Carriers (2014)" (PDF). ↑ "Delta Launches Seattle-Hong Kong, and Seattle Hub - June 17, 2014". airchive.com. Retrieved 2014-06-17. ↑ Ben Mutzabaugh (March 22, 2011). "Delta: 25% cut in flights will make Memphis a better hub". USA Today. Retrieved March 22, 2011. ↑ Nick Kenney (June 4, 2013). "Delta Airlines to de-hub MEM, cut jobs, slash flights". WMC-TV. Retrieved June 4, 2013. ↑ Mutzabaugh, Ben (December 15, 2014). "More cuts: Is Memphis now just another city for Delta?". USA Today. USA Today. Retrieved 22 February 2015. ↑ "Change In Direction Delta Molding Orlando Hub As Southeastern Connection". Retrieved 31 January 2016. ↑ Brown, David. "A DETAILED LOOK AT DELTA AIR LINES HISTORY IN PORTLAND". Airline Reporter. Airline Reporter. Retrieved 4 October 2015. ↑ Carey, Susan (August 27, 2014). "Delta Human Resources and Labor Executive to Retire". The Wall Street Journal. Retrieved 9 November 2015. 1 2 3 4 Esterl, Mike (6 June 2011). "Labor Board Broadens Delta Probe". The Wall Street Journal. New York City: Dow Jones. Retrieved 1 January 2013. ↑ "ALPA's Pilot Groups". Air Line Pilots Association, International. January–February 2012. Retrieved 1 January 2013. 1 2 Hinton, Christopher (3 November 2010). "Delta flight attendants vote against unionizing". MarketWatch. Dow Jones. Retrieved 1 January 2013. ↑ Jacobs, Karen (3 November 2010). "Delta flight attendants reject union". Reuters. Retrieved 1 January 2013. ↑ Association of Flight Attendants v. Delta Air Lines, Inc. , 39 NMB 8 (18 November 2011). ↑ Yamanouchi, Kelly (16 October 2012). "Unions to try again with Delta flight attendants". StarTribune. Minneapolis. Retrieved 1 January 2013. ↑ "Town Hall November 28 - ADFA Update". Association of Delta Flight Attendants. Archived from the original on 2013-10-02. Retrieved 1 January 2013. ↑ Brewer, Angela; Helminski, J.; McMahon, N.; Meyer, G.; Perez, G. "Our Story". IAM Delta. International Association of Machinists and Aerospace Workers. Archived from the original on January 2, 2015. Retrieved 1 January 2013. ↑ "Delta Air Lines Codeshare Partners". Delta.com. Retrieved March 17, 2016. ↑ "Profile on Delta Air Lines". CAPA. Centre for Aviation. Archived from the original on 2016-10-30. Retrieved 2016-10-30. 1 2 "EU Launches Antitrust Probe of Delta/Air France-KLM Joint Venture". Frequentbusinesstraveler.com. 2012-01-27. Retrieved 2012-04-05. ↑ "Delta and Virgin Atlantic To Form Strategic Alliance". delta.com. Retrieved April 3, 2015. ↑ "Delta Air Lines and Virgin Atlantic Airways Welcome U.S. Department of Transportation decision to grant Antitrust Immunity". delta.com. Retrieved April 3, 2015. ↑ Ranson, Lori (December 17, 2011). "Delta prepares for full narrowbody analysis in early 2011". Flight International. Reed Business Information. Archived from the original on January 15, 2011. Retrieved January 15, 2011. ...Delta president Ed Bastian said: "We clearly need to get the DC-9s retired. We clearly need to start to build a replenishment strategy for our older MD-88s and some of our Airbus narrow bodies as well as the [Boeing] 757-200s. ↑ "Delta to cap its narrowbody order at 100 737-900ERs". Flightglobal. Air Transport Intelligence news. August 22, 2011. Archived from the original on 2012-11-05. Retrieved August 22, 2011. ↑ "Delta Said to Defer Order of 100 Small Narrow-Body Jets to 2012". August 25, 2011. Archived from the original on 2011-09-13. ↑ Schlangenstein, Mary. "Delta Mixes Old, New Jets in CEO's Cost-Cutting Fleet Plan". Bloomberg. Retrieved 19 July 2016. ↑ Michie, Taylor. "Delta Inaugurates Boeing 717, Flies to Newark with Airchive Aboard". Airways News. Retrieved 19 July 2016. ↑ "Now Flying For Delta: The Boeing 717". USA Today. ↑ Harty, Jack. 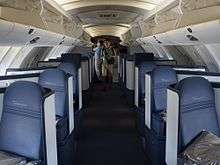 "End of an Era: Delta's DC-9 Completes Final Scheduled Flight". Airchive. Retrieved 20 January 2014. ↑ Harty, Jack. "It's Over: Delta Officially Retires the DC-9". Airchive. Retrieved 25 January 2014. ↑ Thom Patterson, CNN (January 11, 2014). "Delta retires its last DC-9 airliners which spurred travel since 1960s - CNN.com". CNN. Retrieved April 3, 2015. ↑ "Delta to Let Four 747s Fly Out of the Fleet". Huffington Post. August 1, 2014. ↑ "Delta CEO: Boeing 747s will be retired by 2017". USA Today. October 16, 2014. ↑ "Delta adds A350-900, A330-900neo to its fleet plan". November 20, 2014. ↑ "Delta Orders Airbus Widebodies". Airliner World: 14. January 2015. ↑ "Delta buying 75 Bombardier CSeries jets, with options for 50 more". 1 2 3 "Delta redefines cabin, upgrades premium economy options". December 8, 2014. ↑ "Delta Revitalizing Boeing 747–400 Fleet with New Interiors". Multivu.prnewswire.com. September 2, 2010. Retrieved July 7, 2011. ↑ "Delta Adding New 'Economy Comfort' Section on Long-Haul International Flights". News.delta.com. February 7, 2011. Retrieved July 7, 2011. ↑ "Delta Air Lines to Offer Full Flat-bed in BusinessElite on Transcontinental Flights". news.delta.com. November 5, 2012. Retrieved November 5, 2012. ↑ "75Es to get flat-beds in J | FlyerTalk.com". Chris Babb. November 11, 2012. Retrieved November 11, 2012. ↑ Mutzabaugh, Ben (December 15, 2014). "More cuts: Is Memphis now just another city for Delta?". USA Today. USA Today. Retrieved September 1, 2016. ↑ Chris Babb (October 20, 2011). "More Economy Comfort Means More Room to Relax!". Delta Air Lines. Delta Air Lines. Archived from the original on October 22, 2011. Retrieved October 20, 2011. ↑ "Delta to Invest in Customer Experience, Fleet Efficiency". News.delta.com. January 25, 2010. Retrieved July 7, 2011. ↑ "Food". Delta Air Lines. Retrieved November 1, 2012. ↑ Alexander, Keith L. "Passengers find buy-on-board food hard to digest – Airlines are starting to feed fliers again." San Francisco Chronicle. Sunday March 27, 2005. Archived January 3, 2009, at the Wayback Machine. ↑ Morales, Tatiana. "Buy On-Board Meals?." The Early Show/CBS News. July 7, 2003. Retrieved on September 16, 2009. ↑ "Food Sales Test." Delta Air Lines. October 2, 2003. Retrieved on September 16, 2009. ↑ "Food Sales." Delta Air Lines. February 18, 2004. Retrieved on September 16, 2009. 1 2 "Delta restoring free food service." Associated Press at The Honolulu Advertiser. March 10, 2005. Retrieved on December 31, 2012. ↑ "Basic Economy : Delta Air Lines". ↑ Dayton Business Journal (November 29, 2010). "Delta Air Lines adds Wi-Fi on regional jets". Bizjournals.com. Retrieved July 7, 2011. ↑ "Delta Air Lines Blog | A New Year Means More Ways Than Ever to Surf the Internet on Delta!". Blog.delta.com. 2012-01-06. Archived from the original on April 1, 2012. Retrieved 2012-04-05. ↑ Jon Swartz (February 1, 2011). "Airlines Offer Free In-Flight Facebook". USA Today. Retrieved February 1, 2012. ↑ Ben Mutzabaugh (March 26, 2014). "Delta debuts international Wi-Fi on its Boeing 747s". USA Today. Retrieved October 10, 2014. ↑ "Delta Wi-Fi across trans-Atlantic fleet gets customers online". February 3, 2016. ↑ "In-flight Entertainment on your Delta flights". Delta Air Lines. Retrieved September 16, 2011. ↑ "767 International Fleet seating update". Flyertalk.com. Retrieved July 7, 2011. ↑ "Delta to Invest in Customer Experience, Fleet Efficiency – Jan 25, 2010". News.delta.com. January 25, 2010. Retrieved May 4, 2010. ↑ "BREAKING: Delta Air Lines to launch Panasonic's Fusion (Smart!!!)". Flight International. Archived from the original on July 30, 2010. Retrieved July 7, 2011. ↑ "Delta to launch integrated IFEC/seat from Panasonic, Weber". Flight International. Archived from the original on 2011-11-02. Retrieved July 7, 2011. ↑ "No PTVs for regular PMDL 752s, new LCDs instead". Flyertalk.com. Retrieved 2012-04-05. ↑ Chris Babb (September 2, 2007). "Enhancing the Entertainment Experience". Archived from the original on May 14, 2013. ↑ "US majors get with the cabin-upgrade programme" (Press release). Shepard Group. December 16, 2006. Archived from the original on November 7, 2007. Retrieved December 16, 2006. ↑ "Delta A330-300 Cabin |". Airliners.net. Retrieved 2012-04-05. ↑ No, Brisan (2007-12-09). "Delta 737–800 Cabin | Flickr". Flickr.com. Retrieved 2012-04-05. ↑ "Delta Sky Club". delta.com. Retrieved April 3, 2015. ↑ "Delta Sky Club® Perks : Delta Air Lines". ↑ "Even More Reasons to Join". Delta.com. Retrieved 2013-01-31. ↑ "SkyBonus Becomes Official Business Loyalty Program for Delta, Air France, KLM and Alitalia in North America" (Press release). Delta Airlines. Retrieved 2013-01-31. 1 2 3 "Frequently Asked Questions". Delta Airlines. Retrieved 2013-01-31. ↑ "Delta Air Lines Accepts EPA Award for Use of Nontoxic Materials on Aircraft". Delta Air Lines News Release. Delta Air Lines. Retrieved March 18, 2011. ↑ "Delta Airlines Newsroom - Press Kit - History". Delta Airlines. Retrieved 2013-01-30. ↑ "Delta Air Lines Bats a Thousand by Becoming the Official Airline of the Minnesota Twins and... – MINNEAPOLIS, March 30 /PRNewswire-FirstCall/". Minnesota: Prnewswire.com. Retrieved May 4, 2010. ↑ "Delta Partners with Nine Major League Baseball Teams for 2013 Season - Mar 28, 2013". Delta Airlines. Retrieved 2013-09-27. ↑ "Delta and Buffalo Sabres Announce New Partnership - Oct 28, 2013". Delta Airlines. Archived from the original on 2014-08-19. Retrieved 2013-10-28. ↑ "Delta named Official Airline of Los Angeles' Staples Center, L.A. Kings and the Grammy® Museum" (Press release). Delta Airlines. 10 February 2011. Retrieved 2014-10-25. ↑ "Delta Becomes 'Official Sponsor' of World Champion Los Angeles Lakers - Jan 13, 2011". News.delta.com. Retrieved 2013-09-27. ↑ Ben Kessling (26 June 2012). "Delta to Sponsor London Soccer Club". The Wall Street Journal. wsj.com. Retrieved 2013-01-31. ↑ "Delta lands at Madison Square Garden" (Press release). Delta Airlines. October 20, 2009. Retrieved 2014-10-25. 1 2 "Seahawks and Sounders announce new partnership with Delta Air Lines" (Press release). Delta Airlines. 10 September 2013. Archived from the original on September 10, 2013. Retrieved 2014-12-13. ↑ "The Delta Prize for Global Understanding". Uga.edu. Archived from the original on June 5, 2011. Retrieved July 7, 2011. ↑ "Energy Solutions Arena". nba.com. 20 November 2006. Archived from the original on January 9, 2013. Retrieved 2013-01-31. ↑ "Delta Marks Fourth Year as the Official Airline of GRAMMY® Awards" (Press release). Delta Airlines. 9 February 2011. Retrieved 2013-01-31. ↑ Wolf, Alan M. (April 1, 2011). "Delta Air Lines signs deal with Durham Bulls – Travel". NewsObserver.com. Archived from the original on August 22, 2012. Retrieved July 7, 2011. ↑ "Delta Adds Whitney Museum To Growing Portfolio of NY Partnerships". SponsorPitch.com. Archived from the original on March 16, 2012. Retrieved August 4, 2011. ↑ McCombs, Brady (28 June 2014). "Sponsorship of gay pride parades on the rise". USA Today. ↑ "Georgia Tech Yellow Jackets". ramblinwreck.com. Retrieved 2014-11-25. ↑ "Delta and Syracuse University Athletics announce New Partnership". Delta Air Lines. Archived from the original on December 10, 2014. Retrieved 2014-12-07. ↑ "WE LOVE GIANTS!". giants.jp. Retrieved 2015-07-10. ↑ "Delta's New In-flight Safety Video". Youtube. February 20, 2008. Retrieved July 7, 2011. ↑ Flyin'Mom (February 21, 2008). "DL's New Inflight Safety Video". flyertalk.com. Retrieved November 17, 2011. ↑ "Delta's YouTube Star". CNN. July 16, 2010. Retrieved July 7, 2011. ↑ Brett, Jennifer (March 25, 2008). "'Deltalina,' a real Delta employee, is loving the safety spotlight". Ajc.com. Archived from the original on June 29, 2011. Retrieved July 7, 2011. ↑ "Delta's Red-Headed Flight Attendant a Hit on YouTube in Airline's Safety Video." Associated Press at Fox News. Sunday March 23, 2008. Retrieved on August 24, 2009. ↑ "aviation-safety.net". aviation-safety.net. Retrieved July 7, 2011. ↑ "aviation-safety.net". aviation-safety.net. May 30, 1972. Retrieved July 7, 2011. ↑ "NTSB Report AAR73-15" (PDF). Retrieved 2012-04-05. ↑ "First-Person". Northeastern.edu. July 31, 1973. Archived from the original on January 8, 2009. Retrieved March 1, 2009. ↑ AirSafe.com, LLC. "Fatal Events Since 1970 for Delta Air Lines". Airsafe.com. Retrieved March 1, 2009. ↑ "aviation-safety.net". aviation-safety.net. November 27, 1973. Retrieved July 7, 2011. ↑ Magnuson, Ed (September 14, 1987). "Wrong Track: Delta is blamed for a close call". Time. time.com. ↑ "2 Killed as Engine Parts Pierce Cabin of Delta Jet". Los Angeles Times. LATimes.com. AP. 7 July 1996. Retrieved 2013-01-31. ↑ "Traveling on Delta Flight 1989 on 9/11". 256.com. Retrieved March 1, 2009. ↑ "1.1 Inside the Four Flights". The 9/11 Commission Report (PDF). gpoaccess.gov. p. 10. ISBN 0-16-072304-3. ↑ "1.2 Improvising a Homeland Defense". The 9/11 Commission Report (PDF). gpoaccess.gov. ISBN 0-16-072304-3. ↑ "Photos: McDonnell Douglas MD-11 Aircraft Pictures". Airliners.net. February 3, 2002. Retrieved July 7, 2011. ↑ Pasztor, Andy (March 9, 2015). "Delta Crash: Investigators Suspect Possible Brake Problems". The Wall Street Journal. Retrieved 12 March 2015. (subscription required (help)). ↑ "NTSB Issues Second Update on the Delta Flight 1086 Accident at LaGuardia". ntsb.gov. National Transportation Safety Board. March 9, 2015. Retrieved 12 March 2015. ↑ "2015-06-17 Delta Boeing 747-400 badly damaged by hail over China". ↑ "Delta 747 Destroyed By Hail, Aircraft a Total Loss". SavvyStews.com. ↑ Weber, Harry (March 18, 2010). "Delta's Flight 253 Passengers Get Travel Vouchers From Delta After Foiled Terror Plot". The Huffington Post. Associated Press. Archived from the original on 2010-01-02. Retrieved 12 March 2015. ↑ "ASN Aircraft accident Boeing 727 Havana". Aviation-safety.net. March 28, 1984. Retrieved March 1, 2009. ↑ "ASN Aircraft accident Boeing 727 Havana". Aviation-safety.net. August 18, 1983. Retrieved March 1, 2009. ↑ "ASN Aircraft accident Boeing 727 Havana". Aviation-safety.net. July 17, 1983. Retrieved March 1, 2009. ↑ "ASN Aircraft accident Lockheed L-1011 TriStar Havana". Aviation-safety.net. June 11, 1979. Retrieved March 1, 2009. ↑ "Delta Hijacking". NBC Nightly News. Vanderbilt Television News Archive. August 1, 1972. Retrieved 2013-01-31. ↑ "ASN Aircraft accident McDonnell Douglas DC-8 Algiers". Aviation-safety.net. Retrieved March 1, 2009. ↑ "Patrick Smith on Airline Security". Schneier on Security. Schneier.com. 19 June 2006. Retrieved 2013-01-31. ↑ "Hijack Attempt". CBS Evening News. Vanderbilt Television News Archive. February 22, 1974. Retrieved 2013-01-31. ↑ "CUBA: Havana-Bound(subscription required)". Time Magazine. Time.com. 25 August 1980. Retrieved 2013-01-31. ↑ Madeline BarM-s Diaz (17 August 2002). "Tip Yields Arrest Of Hijack Suspect". Sun-Sentinel. sun-sentinel.com. Retrieved 2013-01-31.